Let us start on a journey. A journey back to a time when the Maltese population lived in Malta and Gozo with a cult obsessed with life and death. Symbols of sexuality were common, with many phallic shapes and fertile obese figurines strewn around the remains that have survived to the modern era. Settlers from Sicily had arrived around one and a half millennia before this culture developed bringing goats, cows, sheep, crops, and quickly deforested the island. At some point over this time the population developed an obsession with temple building, and a complex culture around it, that only became more extreme as the civilisation flourished. 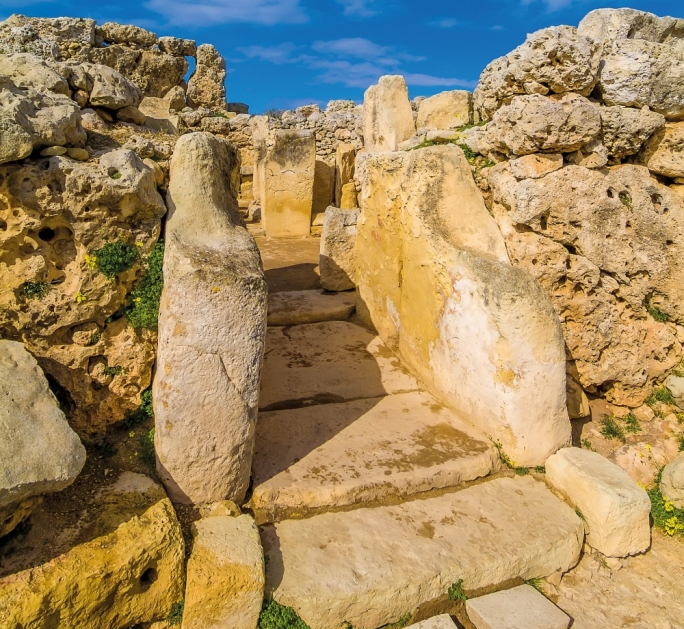 “The Maltese Islands seem to have gone on a complete tangent from what was going on around them giving expression to the Temple Period which lasted for just over a millennium,” Dr Nicholas Vella (Department of Classics and Archaeology, University of Malta) said. The Temple Period civilisation is famous for having built the oldest free- standing stone structures in the world. They covered Malta and Gozo with over 30 temple complexes over their 1100-year history. Apart from extensive temple sites cluttered with the evidence of complex rituals and animal sacrifices, intricate burial complexes were also built showing a deep respect for death. During the Temple Period artwork flourished. Hundreds of statues have been discovered. Although famous for abundantly fertile ‘fat ladies’, these only make up around 15% of the statues found, with phallic and especially androgynous symbols being much more common. How the Islands managed to sustain such a rich culture is a mystery. Another mystery is how it all ended. The Temple people did not suffer from any obvious disease, lack of food, or invasion, at least that is the story the studies carried out until now tell us. One theory is that environmental stress and religious extremism somehow killed them off. The Temple people came and left, ‘we cannot find a successor,’ stated Prof. Anthony Bonanno (Department of Classics and Archaeology, University of Malta). 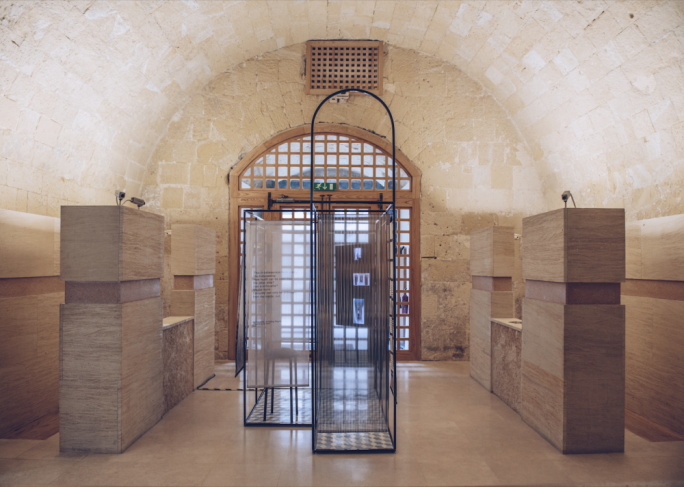 In the early 20th century, Sir Themistocles Zammit’s unearthing of underground burial complexes—hypogea—with the adjoining megaliths of the Tarxien Temples solidified Malta’s identity with this stone architecture. Unfortunately, by the 1950s archaeology had lost its importance in Malta. The craze generated by Temi Zammit’s findings had long died out, and as independence rolled on in 1964 things just got worse, culminating in Mintoff’s government that dissolved the whole Faculty of Arts at the University of Malta. In those days, Bonanno was a lecturer with a lot of time on his hands – “I had very little teaching.” So it came as a lifesaver when the Director of the Tourism Department approached him to organise a conference that, after approval from a new Rector, culminated in a conference in 1985 on Fertility Cults in the Mediterranean. 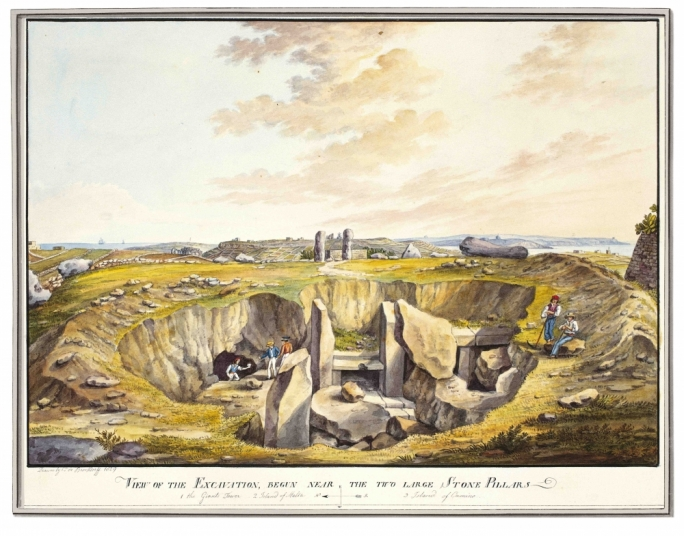 At the conference, amateur archaeologist Joseph Attard Tabone showed how he thought he had rediscovered an ancient stone circle immortalised by Charles de Brocktorff’s watercolours. Amazed by the revelation, world-leading archaeologist Colin Renfew was easily persuaded to organise a dig in Gozo. By 1987, the British were back with Dr David Trump, Prof. Caroline Malone (Queen’s University Belfast, back then Cambridge) and Dr Simon Stoddart (University of Cambridge) all digging alongside the Maltese team that included Bonanno, Dr Tancred Gouder (Museums Department), Vella (back then as a student), and others. A change in government that year reinstated the Faculty of Arts—archaeology was back in the picture. to the site. It has taken up a lot of our lives […] then we decided that that was the limit of our funding and energy,” recollected Malone. Seven years of digging and 220,000 bones from 800 individuals later, and they revealed “a great crater left by a collapsed cave, it had been a hypogeum. A natural hypogeum enhanced by megalithic monuments that probably lasted around 1500 years till 2500 BC as part of the Ġgantija complex.” They had found an archaeological goldmine that helped train a new generation of archaeologists who are all now prominent in the field. The Xagħra Stone circle was an extensive underground burial complex. Not as big as the hypogeum at Ħal Saflieni, that Sir Themistocles Zammit estimated housed around 6,000–7,000 individuals, but it revealed a civilisation whose complexity is unusual for its age and it took over a decade for the Anglo-Maltese team to compile extensive results from the digs. The rituals of the burial practices changed greatly with time. During the early Żebbuġ Period, between 4000–3500 BC, the rock-cut or natural caves housed family units, one generation on top of the other. Bones seemed to have been pushed to the side to make space for the most recent burial. Several gifts were placed with the dead but no obvious human figurines. After this time, the Temple Period flourished. The burial complex was extensively modified with the internal caverns extended and subdivided into rooms with many more enclosed spaces for burials for their complex death rituals. More communal burials seem to emerge, with large pits housing hundreds of individuals whose bones have been separated, sorted, and stacked on top of each other. Grave gifts had transformed to the famous ‘fat ladies’ that are clearly female in this case. At ground level, another grave-pit was found exclusively for male body parts without grave gifts, hinting towards a matriarchal society. It seemed that older burials were removed and body parts sorted into mass pits with newer burials placed in the compartmentalised caves or chambers. To take care of these complex rituals a priest caste arose. “[They] managed the conduct of these buildings [that] served an economic and political purpose.” This clue is one reason for the idea that religious extremism developed and extinguished the temple flame. Isotope and trace element analysis of the bones showed that they were healthy and mostly ate meat or vegetables. The trace elements left by eating copious amounts of fish or seafood are absent. The Temple people were not fishermen but neither were they riddled with disease. Accompanying the magnificent temples and hypogea was an overflow of art. “The art has three forms of human representation: […] one form is dressed, usually standing, ungendered, they have elaborate hairdos, belts, necklaces, and skirts, perhaps a status of office. Another form is the naked fat figures, again mostly ungendered though some are female, like the Sleeping Lady and the Venus of Ħaġar Qim. "There is no evidence that they were being worshipped, but they are representative of ancestors. […] Finally there is another form: the abbreviated or monstrous. You get all sorts of funny little representations: you get phallic symbols, tiny knobs for arms and legs, and all sorts of curious things. In this group you also have everyday domestic animals being shown, reptiles and fish, and birds,” explained Bonanno. “The Gozo dig showed new facets of artistic production.” Bonanno wrote about a set of six plank-like human figurines. They were found interred with, presumably, the artist. “They represent several works of the same artist in different stages of production. One is simply a rough cut, two others showing intermediate stages, and two completely finished products.” Bonanno compared the sculptor to Michelangelo’s unfinished Prisoners or Slaves. Some statues are much larger. “There is only one example of a colossal statue standing 2.5 to 3m high at Tarxien. Only the lower half has survived. Its position in the vestibule, behind the entrance in the Tarxien Temples, with the area being decorated with spiral reliefs, is the best candidate for the representation of a divinity,” said Bonanno. Human sculptures with multiple figures are very rare during this time. This level of artwork was unparalleled according to Bonanno. So why did it all end? Enter FRAGSUS. The Europe-wide €2.3 million study that brings together seven countries, five institutions (the Universities of Cambridge, Malta and Queen’s Belfast, Heritage Malta and the Superintendence of Cultural Heritage), 19 academics, 10 post-doctorate researchers, and around 50 students, all coordinated by Prof. Caroline Malone and all focused on trying to answer the questions: What killed off the Temple people? Why do some civilisations survive for millennia in fragile environments and others do not? Answering these questions (and plenty others) needs many experts on board from fields as diverse as geologists to biologists, apart from archaeologists to interpret it all. They are also using scientific techniques to an extent never seen before on the Islands, from soil and pollen studies to GPS and LiDAR (Light Detection and Ranging laser) technology, all to try and reconstruct the past. Key ingredients are 12 cores that are being taken of Maltese soil and sediments. A core involves taking a circular sample of soil down to the bedrock. In Malta and Gozo this ranges from two to 20 metres in depth. “This is like taking a sample to carry out a biopsy: from a tiny sample you try and build up a general picture, […] if I find material in the core that is suggestive of a very wooded environment it means that the environment was wooded but then eroded. If erosion has taken place, it means that the landscape might not have been heavily terraced. Everything is linked,” illustrated Vella. Research on the Temple people did not stop after the Xagħra Circle dig and these cores are developing on previous ones, however they have never been studied so systematically. Prof. Patrick J. Schembri (for more about his research see www.um.edu.mt/think/a-life-studying-life/) is leading the local team studying molluscs, which includes snails, found within these cores to figure out the past environment and cultural habits. “We found a great many species that not only tell us about the environment at the time but also about how this has changed. As a bonus they also tell us about human activities,” stated Schembri. Researcher Dr Katrin Fenech went into greater detail about how much information we can glean simply by studying assemblages of snails. For a snail, the Maltese Islands and seas have not changed too much over the last seven thousand years, so you find similar species back in the Temple Period as today. “The species can be broadly categorised into ‘land snails’, ‘brackish water molluscs’ and ‘marine molluscs,” said Fenech. These categories can be split into whether the snails live in the open countryside, or love shade, or live just about anywhere. So if you find a shade-loving snail (such as Ferrussacia folliculus) in a place that is today rocky and dry, you can assume that just before Neolithic humans landed on Malta there were a lot more trees. Because they are taking so many cores, they can refine these statements to specific areas. At Tas-Silġ, a Neolithic temple site that was reused by subsequent civilisations, “the marine molluscs that were found all came from habitats at Marsaxlokk Bay that still exist today or were known to have existed in the not so distant past,” said Fenech. Since the marine molluscs are edible, this shows that although sea food was not a regular on the menu, it was part of their diet. Land snails seem to have been a preferred delicacy. “At Taċ-Ċawla [a Neolithic settlement during the Temple Period] we recently found and excavated the first ever true shell middens in the Maltese Islands. These consisted of thousands of large edible land snails. Over 90% of snails were the red-banded snail (Eobania vermiculata). This snail is still found all over Malta, but while still eaten in Crete, it is off the menu for the modern Maltese. It’s a cultural notion, whether you eat them or not. At Taċ-Ċawla, they quite clearly ate them, at Tas-Silġ and at any other archaeological sites in Malta, this is not so clear,” explained Fenech. Prehistoric Malta has often been depicted as a wooded wonderland, pristine before the taint of humanity. Molluscs nod towards a different story. “The very few typical forest or woodland species that exist in the Maltese Islands (e.g. Lauria cylindracea) have not been found in any archaeological deposits.” If Malta were wooded, it was not Island-wide. “The Islands had large patches of extensive vegetation cover, although whether this was forest, woodland or scrub-land is a matter of definition. This is one area that FRAGSUS is investigating,” emphasised Fenech. Going back to the puzzle of what killed the Temple people off, when I asked Fenech about the idea of rapid ecological change, she quickly replied with “define ‘rapid’ There is evidence from Marsa that indicates warmer, wetter periods as well as cooler, dryer periods. Whether this change was sudden or gradual is impossible to say.” The problem is inadequate radiocarbon dating to get more accurate dates and the low number of cores studied. FRAGSUS should change that. The Maltese team are not the only ones looking at these cores. They are being split in half with Dr Chris Hunt (Queen’s University Belfast) and other colleagues looking at its pollen, soil composition, bone fragments, and tephra (although the Maltese team are studying some of these as well), which all tell you about the conditions under which the soil was created. “Most of our cores are from coastal locations, which are great because you get deep cores and good preservation due to the anaerobic [oxygen-free] conditions,” explained Dr Reuben Grima. Malone had previously emphasised, “every last granule here, we will date”. While probably an exaggeration, the approach is important - study everything using any scientific discipline you have at hand, then piece the puzzle back together. Another important piece of the Temple people puzzle is the studies into ancient and modern landscapes. The local specialists are Dr Nicholas Vella and Grima aided by researcher Dr Gianmarco Alberti. Part of their work involves studying the landscape to see how people exploited the land for cultivating crops and raising animals. These two ways of life were the mainstay during the Temple Period. What would have made most sense to the Neolithic Maltese was to mix and match these lifestyles. “On a small island rainclouds can literally pass you by, missing you time and again.” Poor harvests could have been regular. “They would have had a range of crops like wheat and barley, as well as lentils, fruit, and olives,” explained Grima. They also had sheep, goats, and cattle as abundantly found around the Tarxien Temple Complex. “At the megalithic monuments they were either practising ritual sacrifice or ritual feasting, either as a gift to the god/s or to keep the population happy, healthy, cohesive, and power to the priest caste”. Using these strategies, they survived for hundreds of years. To make sense of the huge amount of information needed to understand how an entire civilisation lived, the archaeologists are using models to reconstruct the past. Grima modelled the Neolithic monuments in his research. He used a GIS model to map all the temples in Malta and study why those sites were chosen. “The temple builders chose areas near fresh water springs, close to low-lying areas with a low gradient, which are better suited to accumulate soil, rather than high windswept areas prone to erosion. The temples have a convenient access point to the sea, with a preference for south-facing slopes for the megalithic monuments.” It is likely that the Temple people built their huts near these monuments. “At Skorba [another Neolithic site] it is very obvious because you have huts built next to and in some cases below the foundations of megalithic monuments.” FRAGSUS is allowing the reexamination of these temple, hypogeum and residential units with a much wider range of specialists, tools, and resources. In the Knights’ and British periods, Vella and his team are figuring out that “landholdings would have a bit of the garigue on top because that is perfect for collecting firewood and for a degree of pasture. [Underneath this] is where you will have a spring, therefore your farm and gardens are found there. Horticulture would be practised at that level. "Then you have a clay slope, and that is where you will plant your grain. You don’t need to water it because the clays are going to keep moist even throughout summer. Then you will probably reach the valley bottom, which does not belong to anyone because you need to have running water (recently ignored by the Maltese construction industry),” explained Vella. Again, FRAGSUS is going to bring a wealth of new information from the core studies and over five dig sites around the Islands. “The above all leaves a lot of unanswered questions,” remark Grima and Vella. How did the ancients raise their animals? What did a day in their life look like? Why didn’t they fish much? How much trade was there with other civilisations? Who was being buried at these sites—the leaders of the settlements or everyone? Was everyone healthy? To try and understand, the FRAGSUS team have just dug up a Neolithic settlement in Gozo. Dig sites are the other key source of information for archaeologists. I went to visit one at Taċ-Ċawla in Gozo two weeks into the dig. It is one of the few examples of prehistoric domestic life and might help answer many of the questions Grima and Vella pose. Despite its importance, “it was a dumping site for 20 years, since the council never took [the rubbish] away. I’m afraid it has been neglected,” lamented Malone, on site with a team of enthusiastic students from Malta and Britain. The site was found around 25 years ago because of “some Dutch amateur archaeologists who made a big fuss about […] an illegal building on this very spot.”I was shocked but not surprised. The building frenzy in Malta has rarely cared much about the history and ecology of the Islands, with many artefacts probably destroyed. “At Taċ-Ċawla, we have a very intense settlement, wonderful material culture is coming out—pottery and dark soil which makes us very happy”. Malone went on to explain, “dark soil is full of charcoal and human excrement, all the stuff that represents living and it tends to be black like a compost heap”. Examining what these people threw out lets archaeologists know the their diet, lifestyle, and culture. “We will be sieving this dark soil, all this carbonised material […] to float off all those lightweight bits into mesh and then look under a microscope to identify bits of chaff, plant remains, tiny teeth, bones, all sorts of stuff and recognisable seeds,” explained Malone. They are splitting the area up into square metres to study it all and be able to plot where and what they did in each area. This is a 3D model of their lives. Such a systematic approach has rarely been undertaken on the Islands and never on this scale. It needs this big team and millions of Euro. The approach is necessary because archaeology has moved on in leaps and bounds from the time of Temi Zammit. It has become a rigorous science. “Archaeology has changed out of all recognition from retrieving material to understanding the relationship between all the component parts into something that is far more meaningful,” explained Malone. “We already have an idea that they ate rather less well at the end of the Temple Period than at the beginning. 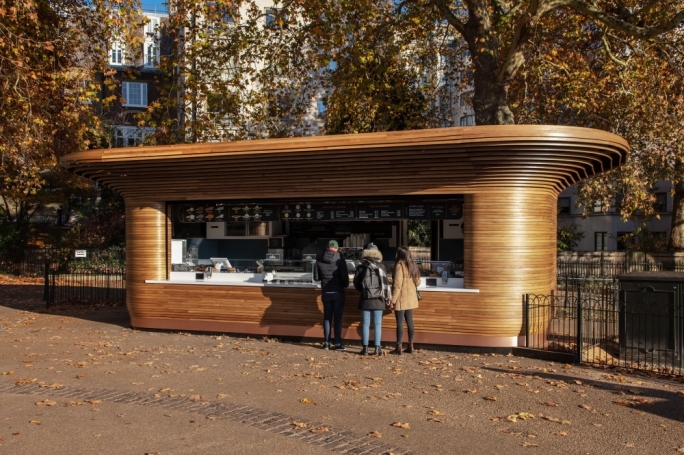 They got less meat and they had no fish.” If this team get it right, within a few years they will have cracked the code. The FRAGSUS team are planning to take things further. Site digs are being planned all over the Islands but it is also an opportunity to go for field walks, collecting pottery to try and see if there are concentrations which might conceal archaeological sites. It could provide new sites to dig for decades. All of this will feed into that model of prehistoric Malta, giving more and more clues to build a picture out of this jigsaw of evidence. 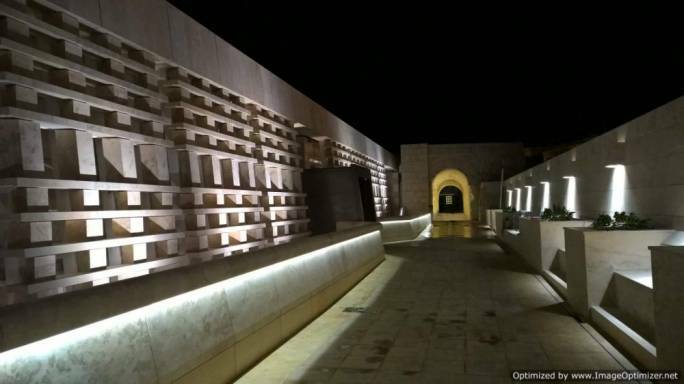 The Maltese team are seeing this as an opportunity not only to figure out this puzzle so closely linked to the Islands’ identity, but an opportunity to study a big chunk of Maltese history through all ages. For example, at the Taċ-Ċawla site they had to remove classical Punic/Roman vine trenches, which will also be studied. In Malta and Gozo, history has tended to pile up on top of itself. The advantage of being so small. FRAGSUS is a fantastic opportunity to put the spotlight on Malta and invest properly in Archaeology. Archaeology is not a discipline obsessed with the past. You can only know the present by understanding the past, and the idea of a fragile ecosystem is still prevalent in Malta. Our environment defines our situation. “There are island environments that are overpopulated and yet they manage to survive because, presumably, they have some form of in-built resilience. It is a word we use a lot because of the financial crises, the resilience of certain places more than others. How far can you go in a place where resources are finite and when you have to depend on help from abroad?” cleverly pointed out Vella. We are quite sure how the Temple people did not die, but uncertain about why they did. Even if we cannot draw a direct lineage from the Temple people to us, by figuring out how they died, Malta can figure out how to flourish.